The 6th Annual GreenStep Awards honored the best in sustainability work from around the carpet industry on August 5, 2014. CRI member companies Engineered Floors, J+J Industries, Mannington Commercial, Mohawk Industries and Shaw Industries were all recognized for their dedication to the environment and sustainability at the awards presentation. Floor Covering Weekly hosts the annual awards event which was founded in 2008 as a way to recognize sustainability initiatives, promote those efforts and honor individuals and organizations working to advance sustainability. There was a strong turnout for the event, with leaders from throughout the carpet industry in attendance. FCW Publisher and Editor-in-Chief Santiago Montero opened the event by reviewing the history of the GreenStep Awards. 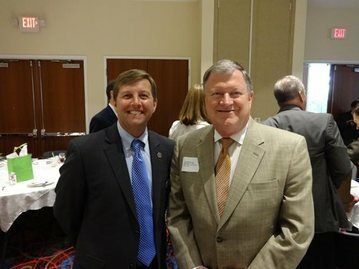 Keynote speaker Carl Campbell, project manager for the Georgia Department of Economic Development, spoke on the importance of the carpet industry and how its innovation is advancing the economy in Georgia. Award winners were chosen by a panel of judges from across the flooring industry, including Dr. Bob Peoples. Executive director of CARE (Carpet America Recovery Effort). After the awards presentation, Mr. Montero thanked industry representatives for their dedication to sustainability and for their work in making sustainability a major prerogative for the entire industry. CRI is proud to see its members honored for their work and congratulates all those honored at the show. Thanks also to the team at Floor Covering Weekly for recognizing the great work done by our members.